1840s/1850s autograph album of Cordelia (Shaw) Lyon of Chatham, Ohio, compiled before and after her marriage to Marcus Lyon. Many of the sentiments were written in response to the death of Cordelia's beloved child Perla [or Perle]. 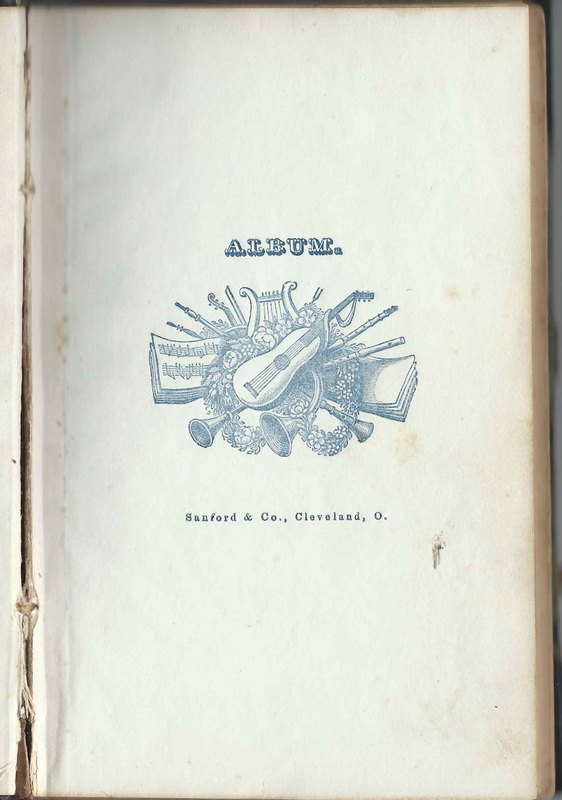 The album is approximately 7" x 4-3/4" and contains the sentiments of 36 of Cordelia's relatives, friends and pastors. An alphabetical list of the signers appears at the end of this post. There are two engravings in the album. 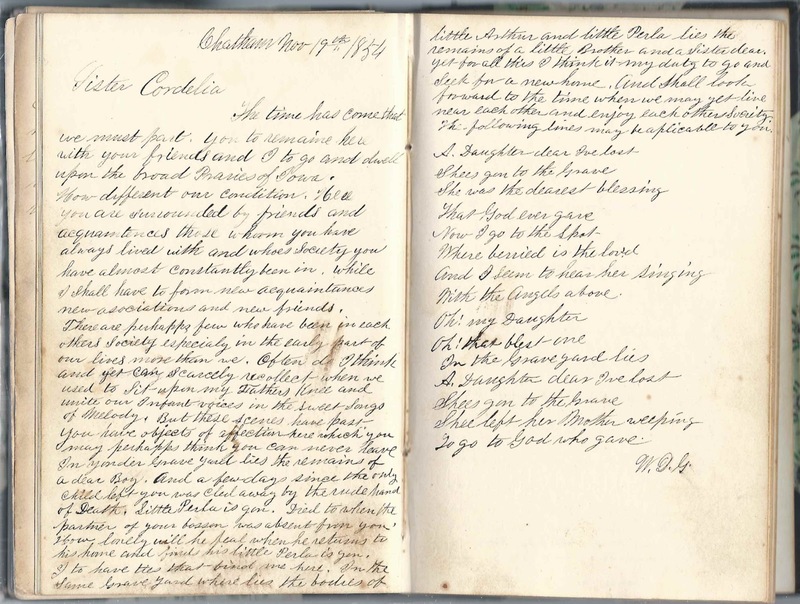 There are three pages that reflect the missionary work of Massachusetts natives Rev. Samuel Clapp Pixley and his wife Louisa (Healy) Pixley in South Africa. Rev. 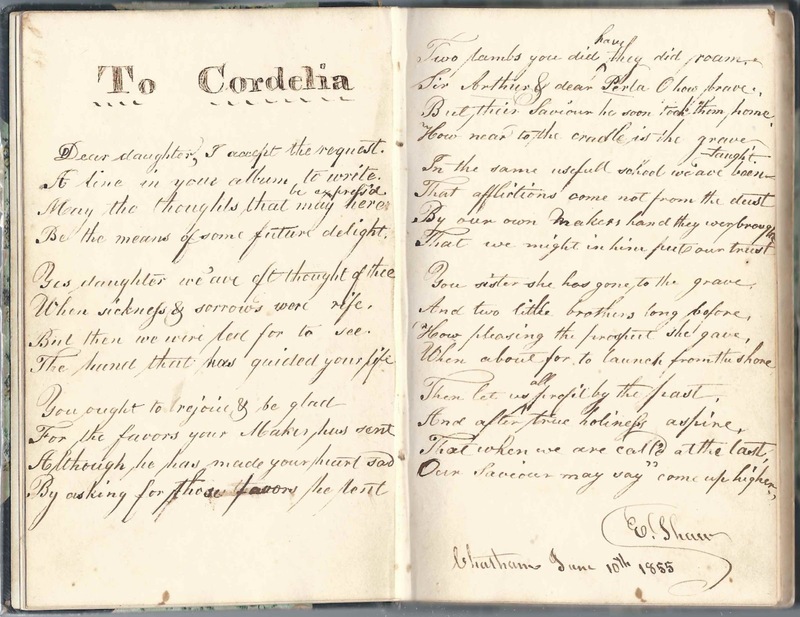 Pixley inscribed his page to "Cousin Cordelia." 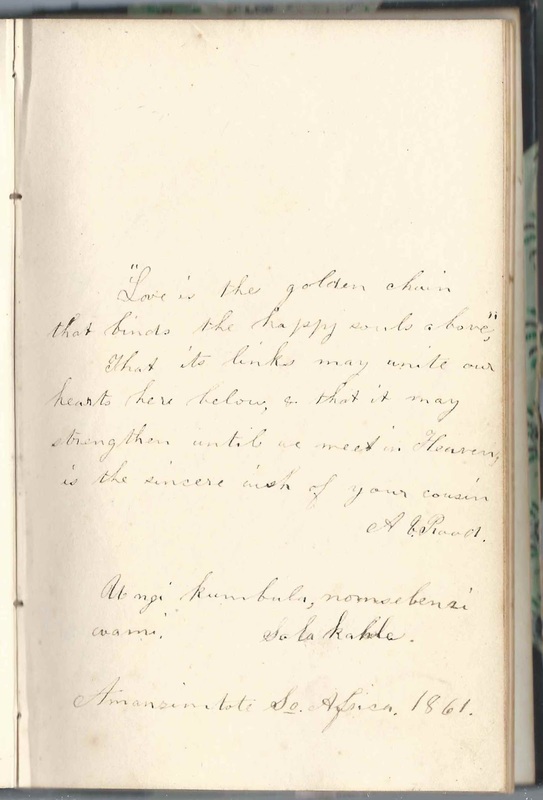 In the page signed by Louisa (Healy) Pixley on March 16, 1883, she mentioned Inanda, "Our Home", which was their mission at Nahal. Rev. Pixley was responsible for the first translation of the Bible into Zulu and for arranging for the education in Massachusetts of promising student Pixley ka Isaka Seme, who was born at the Inanda mission about 1881, the son of Isaka Sarah (Mseleku), who was the sister of John Langalibalele Dube, first president of the African National Congress. If anyone can translate the bottom of the page below, I'd be very grateful. It's perhaps signed by two people, or maybe just one, and mentions Chatham Center, Ohio, and Amanzimtoti, South Africa, in 1861. The signer at Chatham Center, Ohio, was Cordelia's cousin, or the cousin of her husband, Marcus Lyon. After graduating from Northfield Mount Hermon School and studying at Adams College, part of the mission at Amanzimtoti, South Africa, Seme was accepted at Columbia University and later at Oxford University, where he received a law degree. He and other foreign-educated South Africans returned to their homeland in 1911 after the creation of the Union of South Africa. The first black lawyer in South Africa, Seme was one of the founders of the South African Native National Congress, precursor to the African National Congress. Cordelia Shaw was born about 1830 in Massachusetts, the daughter, I think, of Ebenezer and Nancy (Torrey) Shaw, who were born in Cummington, Massachusetts, and Plainfield, Massachusetts, respectively. The family moved to Medina County, Ohio, about 1832. 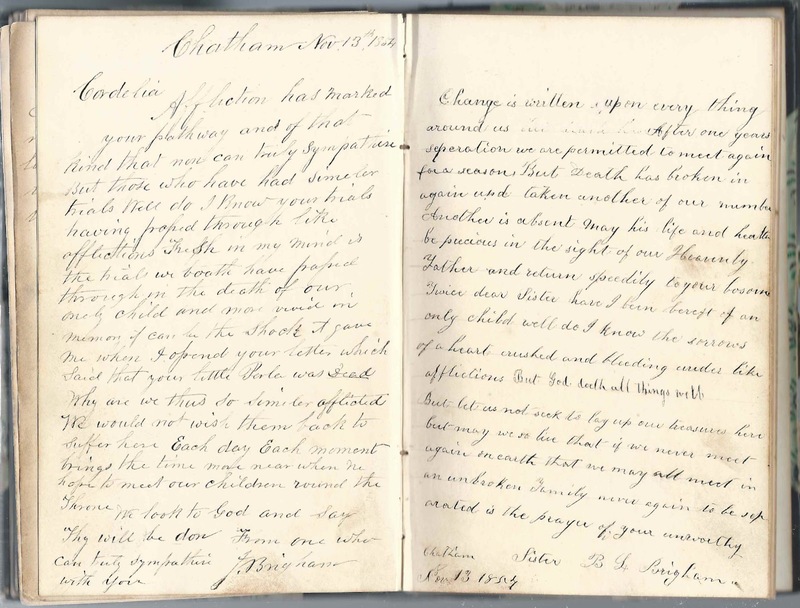 Ebenezer signed a page at Chatham, Ohio, on June 10, 1855; he inscribed the page to "Dear daughter" and attempted to comfort her in her sorrow at the loss of "Sir Arthur and dear Perla". He mentioned that he had lost a daughter and two sons. 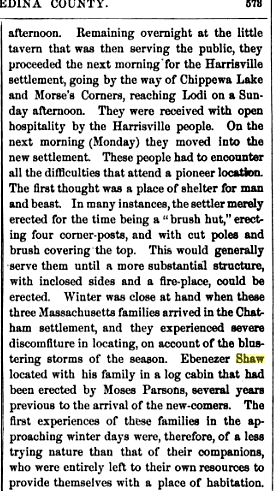 The story of how Ebenezer Shaw and family of Cummington, Massachusetts, came to Ohio is told in the History of Medina County and Ohio: Containing a History of the State of Ohio, from Its Earliest Settlement to the Present Time ... , a History of Medina County ... , Biographical Sketches, Portraits of Some of the Early Settlers and Prominent Men, Etc., written by William Henry Perrin, J. H. Battle and Weston Arthur Goodspeed, and published in 1881. Click on the image to enlarge it. 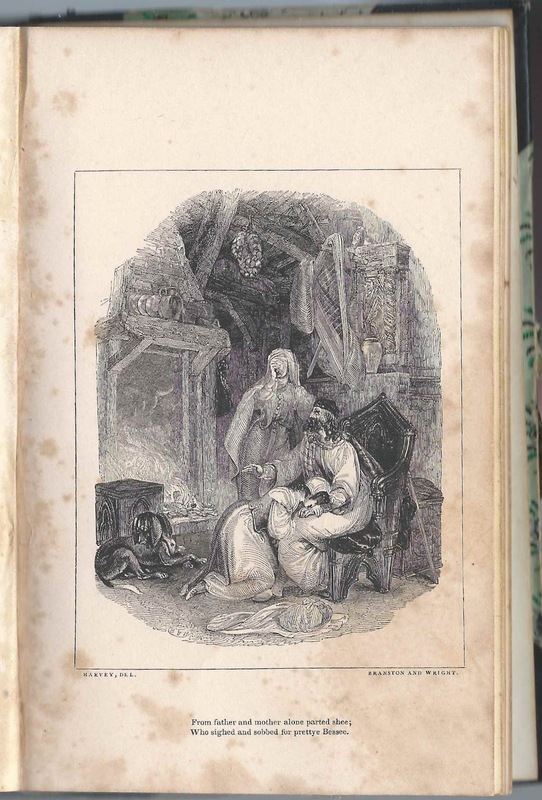 The T. Shaw who signed a page may have been Cordelia's brother or cousin Thomas S. Shaw. I found places where his parents were given as Ebenezer and Nancy (Torrey) Shaw, and other places where he was shown as the son of John and Polly (Beals) Shaw. Several other people mentioned a family relationship with Cordelia, though some of there were actually in-laws. Among these, a cousin who signed with initials at Chatham, Ohio, in October 1855. The initials look like L. B. P., but I'd be interested in readers' interpretations. 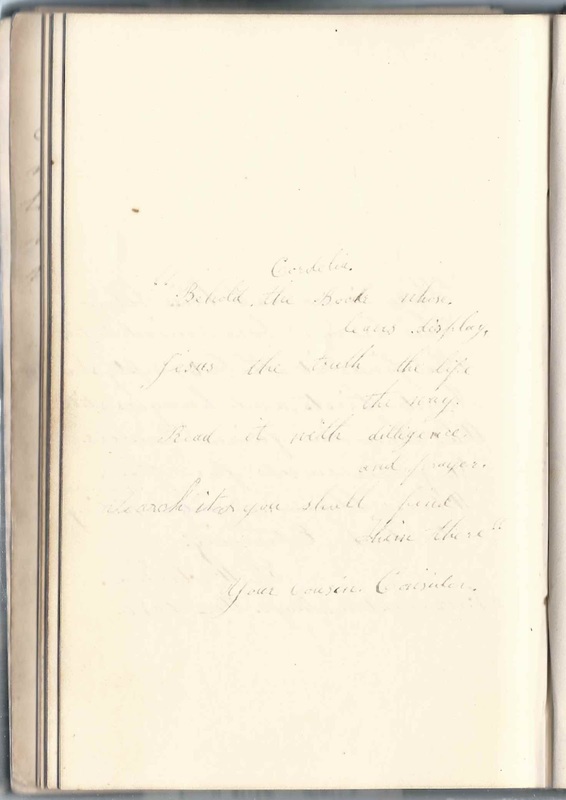 The next page was inscribed to Cousin by C. G. Bisbee, at Chatham, Ohio, on February 28, 1855. 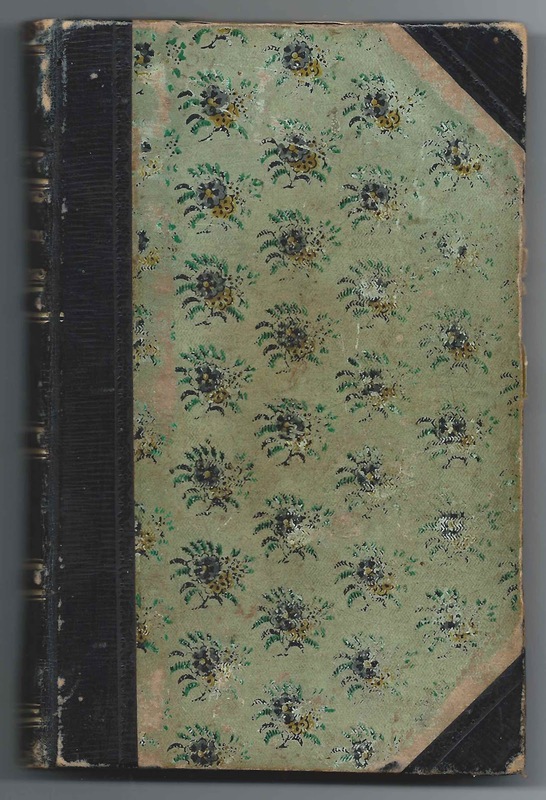 The facing page was signed by Helen M. Bisbee at Chatham, Ohio, on September 16, 1861. About 1848, Cordelia Shaw married Marcus Lyon, son of Elias and Relief (Thayer) Lyon, who had also brought their family from western Massachusetts to Chatham, Ohio. Marcus was born 5 February 1827 at Goshen, Massachusetts. Marcus was involved in several enterprises, chief of which was the Wauseon Flour Mill, in which an early partner was his brother-in-law Joel Brigham, whose wife was Marcus' older sister Betsey (Lyon) Brigham. 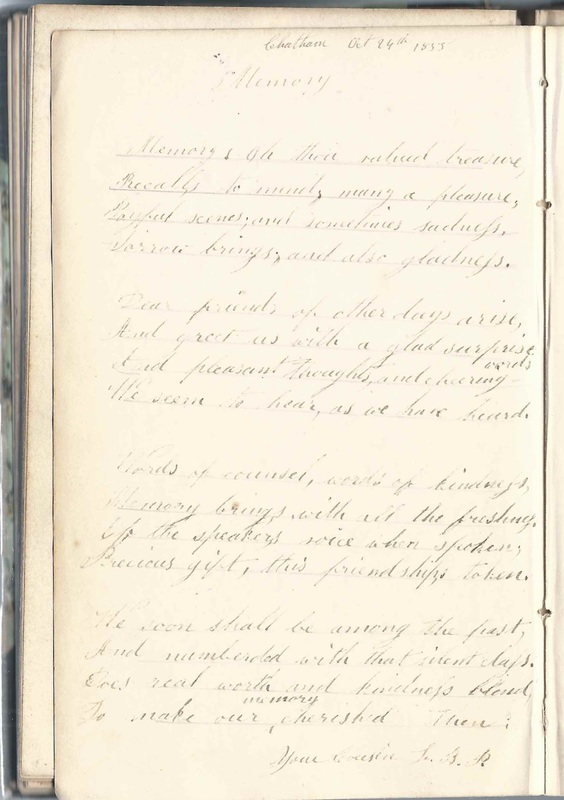 Joel and Betsey Brigham signed facing pages of sympathy and support in Cordelia's album at Chatham, Ohio, on November 13, 1857. Marcus imported the 16 hand chestnut Morgan stallion Bob Morgan, foaled in 1850, from Vermont. His pedigree shows many crosses to foundation sire Justin Morgan. Another of Marcus' sisters was Harriet N. (Lyon) Gardner, wife of Weston Duane Gardner. 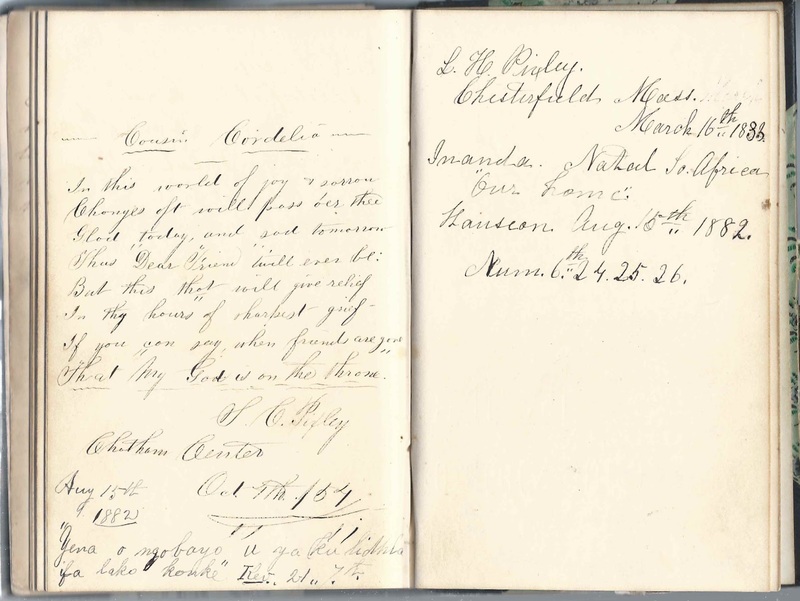 Weston signed facing pages, and Harriet signed the following page at Chatham, Ohio, on November 19, 1854. Weston indicated that they were about to make their new home in Iowa. Cousin Consider signed a page. Marcus Lyon died in 1902, and Cordelia in 1916. They're buried at the Wauseon Union Cemetery at Wauseon, Ohio. 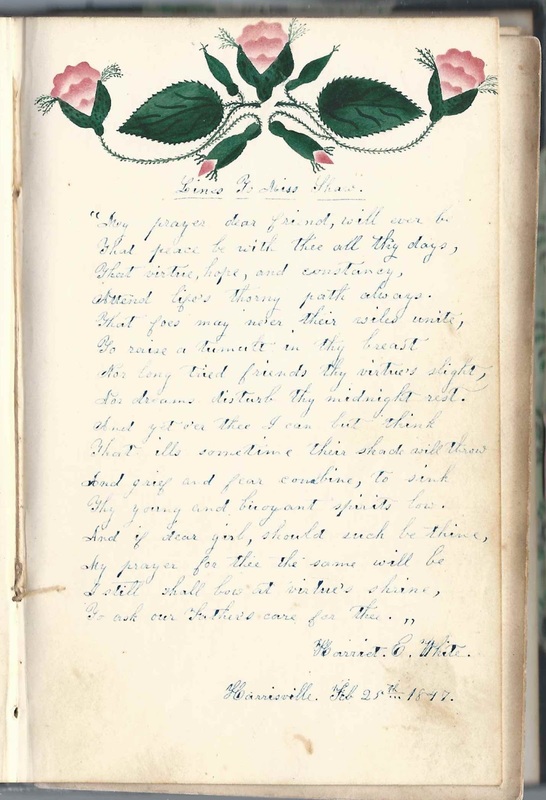 Harriet P. White inscribed a page to Miss Shaw at Harrisville, Ohio, on February 25, 1847 and painted a theorem-like floral arrangement. 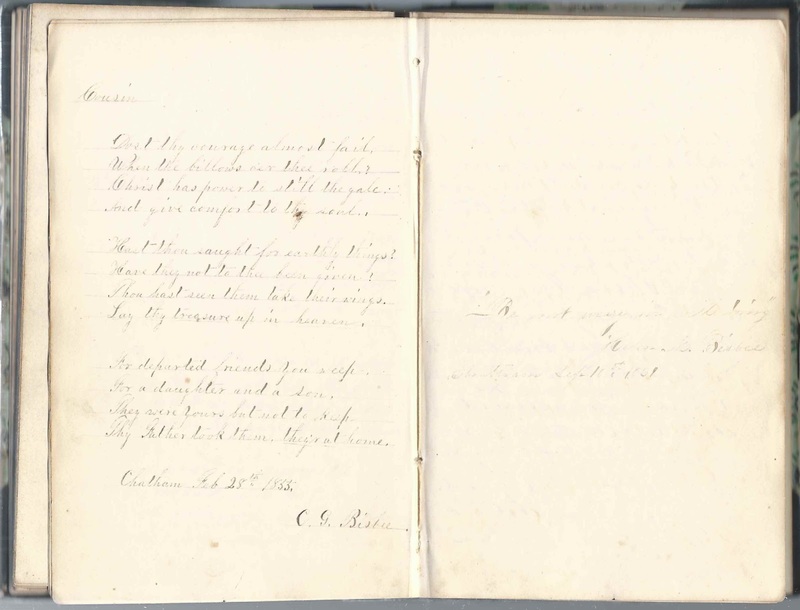 C. G. Bisbee, signed at Chatham, Ohio, on February 28, 1855; inscribed the page to "Cousin"
J. Brigham; presumably Joel Brigham, husband of Betsey L. Brigham who signed the facing page. Sister B. L. Brigham, signed at Chatham, Ohio, on November 13, 1857. She was Betsey (Lyon) Brigham, sister of Cordelia's husband Marcus Lyon, and thus Cordelia "sister-in-law"
H. N. Gardner, signed at Chatham, Ohio, on November 19, 1854; Harriet N. (Lyon) Gardiner, wife of signer W. D. Gardner and sister of Cordelia's husband Marcus Lyon. 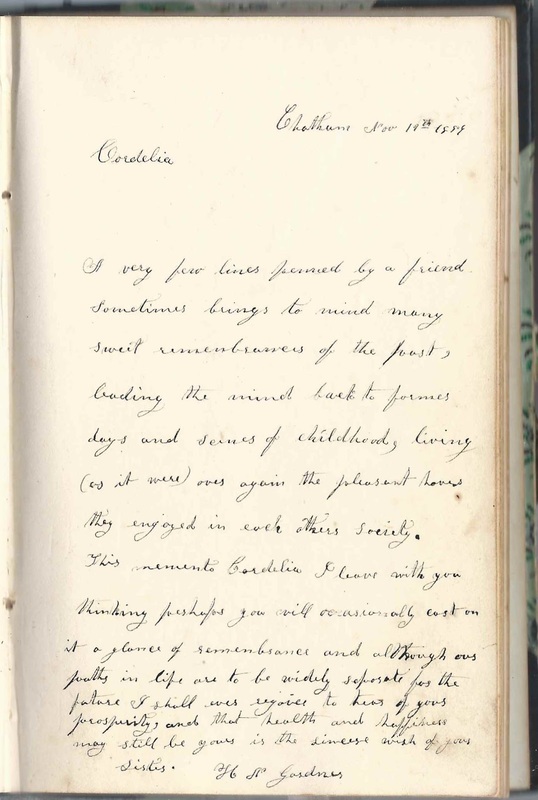 Inscribed to "Cousin Cordelia", by S. C. Pixley of Chatham Center, Ohio, signed in October 1854 and again on August 15, 1882. 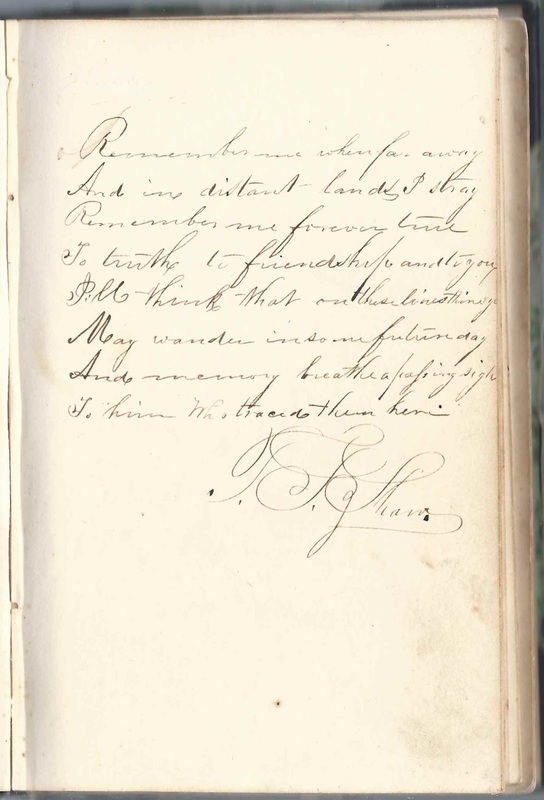 He was Stephen Clapp Pixley, whose wife Louisa (Healy) Pixley signed the facing page. http://www.congregationallibrary.org/finding-aids/PixleyStephenLousia4742 Rev. Pixley was instrumental in the education of Pixley ka Isaka Seme: http://www.sahistory.org.za/people/pixley-ka-isaka-seme and http://historyofafricaotherwise.blogspot.com/2013/12/south-africa-seme-pixley-ka-isaka-isaac.html. Rev. Pixley or Mrs. Pixley or someone else wrote some words in an African language at the bottom of the page. 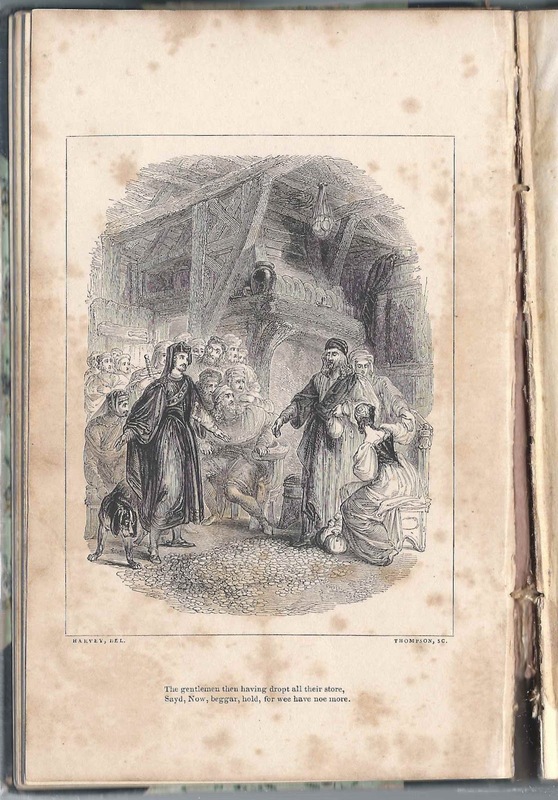 S.Adaline Rice; the facing page was signed by Sarah A. Rice (not sure of middle initial). They were born in Massachusetts and moved to Ohio. E. Shaw, signed at Chatham, Ohio, on June 10, 1855 and inscribed "Dear daughter". Ebenezer Shaw, Jr., Cordelia's father, who would live until 1862. He wrote on facing pages to support her in her grief over losing a child and mentioned that he had lost a daughter and two sons. T. ? 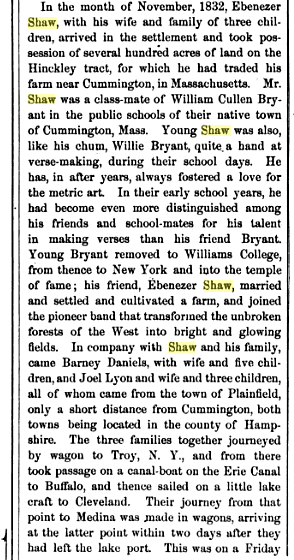 Shaw; perhaps Thomas S. Shaw, born 12 March 1825 at Cummington, Massachusetts. Some sources say that his parents were Ebenezer Shaw, Jr., and Nancy (Torrey) Shaw, thus making him Cordelia's brother. Other sources have his parents as John and Polly (Beals) Shaw. If so, he may have been Cordelia's cousin. I am a distant cousin of Cordelia Shaw Lyon. This is a great find. My family followed the same path: Plainfield, MA to Chatham, OH to Wauseon, OH. Is this for sale? The Plainfield Historical Society would be interested in it. Still available. Contact info under Inquiries in the right margin near the top.